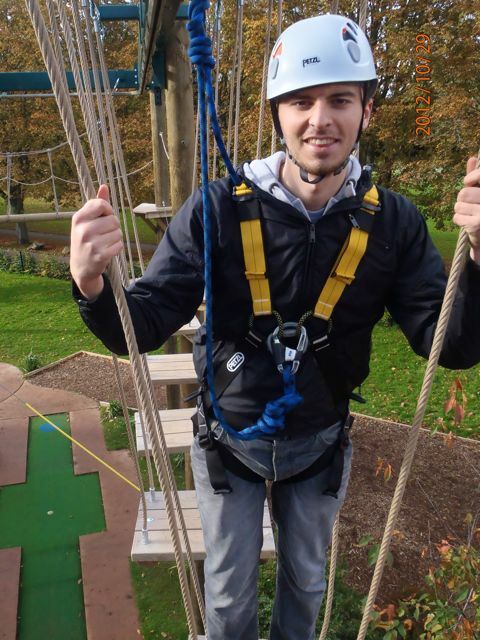 I hadn’t really ever been on a high ropes course before, so when Dan Brice from the Vivary Adventure & High Ropes Centre in Taunton, Somerset invited me and a friend to come and have a go, we both jumped at the chance! 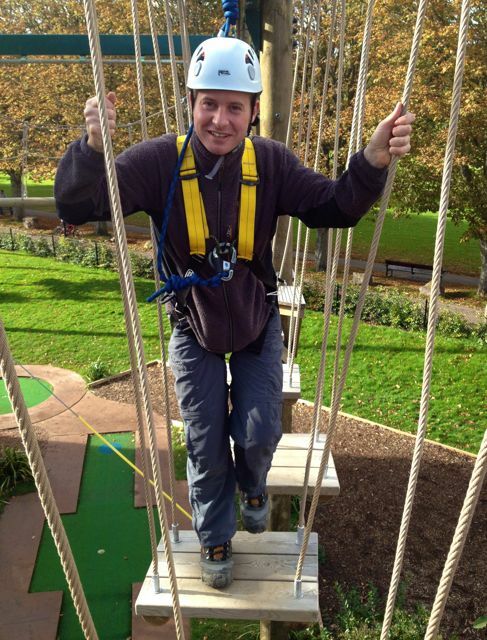 The friend in question was Martin Lacy, and although having done high ropes once, a long time a go, as well as having a slight dislike for heights, he seemed up for it! Well I “roped” him in to it really! We headed down to Taunton to meet with Dan in a rather nice looking log cabin situated within Vivary Park. On all sides people were walking past, gazing up at the high ropes. The place was surrounded by very mature trees in autumnal colour which gave the whole place a really nice feeling. They do a nice cup of tea there too! Kitted up in body harness and helmet, we headed over to the low ropes to start our session. The low ropes are the introduction in to high ropes and about half the height, so if the high ropes look a little daunting, this is a great way to ease in to it. The centre uses a Niko rail system, essentially this means that once you are connected to your guide line, you can’t un-click it until you have finished, so no way of falling off! We used the low ropes to test out the cameras we had with us, and also as Martin isn’t a huge fan of heights, it gave us some time to warm up! It’s a fairly simple course if you are confident, but great fun! Completing the low ropes, we headed up the tower to the start of the high ropes. This also gave us a chance to have our first look at the power fan jump. More on that later! 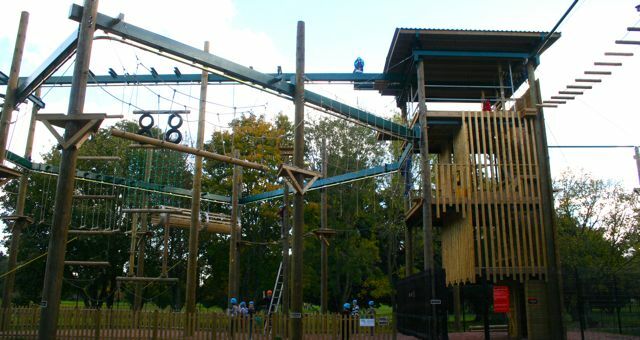 The high ropes use a safe roller system, which is slightly different, but essentially once connected, you are secure until you have finished the route. The height, now doubled, is a little more noticeable and the course more of a challenge. We were also filming and taking pictures for this article whilst going around needed a little more concentration! The challenges we faced on the high ropes were varied from swinging planks, tunnels, ropes, and a personal favorite, the zip wire which throws you onto a cargo net. Martin seemed to be enjoying every challenge too, although with a strange look of fear in his eyes! Completing the high ropes meant there was only one thing left to do, it was time to jump off the top on the power fan! A power fan is a system that allows you to fall at a safe speed, slowing as you go, until finally coming to a stop at the bottom, so very safe, but a mental challenge for sure. 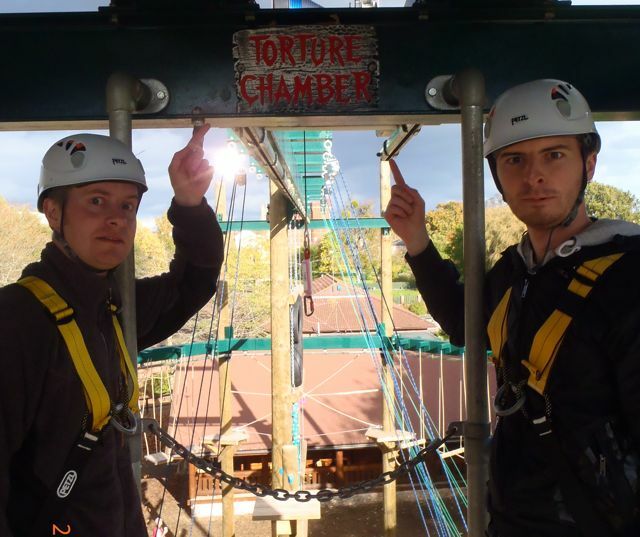 I was clicked in once again by Dan our guide, and ignored the halloween decoration saying “torture chamber” before leaning forward. It’s a brilliant way to make your way down the tower to the ground, the feeling of falling is as good as ever and ended off a very fun afternoon! Unfortunately Martin just couldn’t do it, apparently it made him dizzy and his body wouldn’t let him, I did take the micky a little afterwards, but for someone who wasn’t overly keen on heights, he did really well, and everyone has their own goals and achievements in life! The centre is very well laid out, giving you plenty of challenges to take on and very well built. We both felt very safe and very welcome at the centre, which added to the lovely backdrop made the whole session very enjoyable, would recommend it for adults and kids alike!